A new telescope’s unprecedented study of subtle variations in lunar light could finally give Earth-facing satellites a common reference point for their observations. At the heart of the new project lies a 150-millimeter telescope under construction at Mauna Loa Observatory on the Big Island of Hawaii. In 2018, the new instrument is expected to start taking measurements of the Moon’s reflected sunlight with unprecedented accuracy for 3–5 years. Researchers at the National Institute of Standards and Technology (NIST) are conducting the project. Lunar calibration experts say that those measurements will make it easier for Earth-observing satellites to coordinate and share data. That’s because although satellites are now able to use the Moon to set their own internal baselines for brightness and color measurements, they don’t have a standardized, absolute set of lunar light measurements to use as a shared reference. Such satellites carry a flat white panel, called a diffuser, that they use as a reference to recalibrate cameras and other instruments to a baseline white of a known reflected brightness. Over time, however, gases released by the satellite condense on the panel’s surface, changing its color and reflectivity. That’s a problem if you’re trying to observe subtle, gradual changes on Earth, like warming oceans or deforestation. “If you’re looking at a part of the Earth and it appears to be changing, but your reference is actually changing, you’ve got a problem,” said physicist Joe Rice, group leader of the Remote Sensing Group at NIST. That’s where the Moon comes in. In the late 1980s, scientists at USGS realized that satellite-based imagers could use the Moon as a reference because the light it reflects stays nearly constant. “Basically, the Moon is the most stable reflectance thing up there, and that’s in large part because it doesn’t have an atmosphere,” Rice said. USGS developed a model based on observations from ROLO, and the agency provides satellite operators with model-generated predictions of lunar spectral irradiance, the intensity of the Moon’s reflected sunlight at various wavelengths. Satellite operators check their own observations of the Moon against these predicted values. Often these checks revealed that something was off. “Some of these satellites have seen tens of percent of degradation over time to their diffuser panel, and if it wasn’t for the Moon, they wouldn’t know that,” Rice said. But the technological capability of ROLO didn’t allow it to make measurements as accurate as scientists would like. “They did a great job, but the uncertainty in their measurements in an absolute sense is thought to be somewhere between 5% and 10%,” Rice said. That’s not a problem for keeping one satellite calibrated to itself. Because the Moon’s relative brightness and color change little over time, the imager can keep its “white” the same from year to year by recalibrating to the Moon at regular intervals. But if different satellites want to combine or share data, they don’t have a common reference point, Rice said. The same problem arises when scientists want to compare data from satellites that operated at different periods of time. In those cases, satellite operators currently must verify their satellite data against simultaneous measurements taken from aircraft or the ground or arrange for some orbital overlap during which the different satellites fly for at least a little while over the same terrain at the same time so that differences between imagers become apparent and can be corrected for, NIST scientists said. 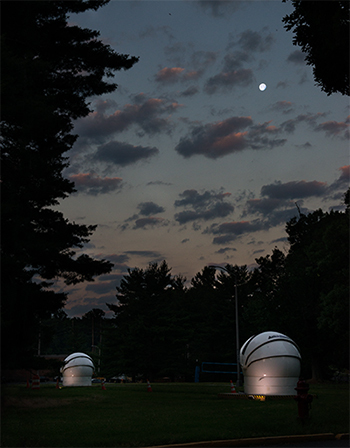 The NIST telescope will take in a broader spectrum of moonlight than ROLO, from ultraviolet wavelengths through the visible spectrum and into shortwave infrared. The telescope’s calcium fluoride lens, unlike glass lenses, can focus the full range of wavelengths onto a detector. To make certain that its observations are tied to the International System of Units (SI), the NIST team will use an SI-calibrated light bulb as a reference point. Linking the measurements to SI in this way connects them with an absolute standard. Previously, ROLO used the star Vega as its reference. By observing the Moon over several years, the team will be able to measure the brightness of the Moon at every phase of the lunar cycle and through all the seasons, as well as through part of the Moon’s libration cycle, a pattern of oscillations that slightly shifts the Moon’s angle to Earth. Although the cycle repeats every 20 years, Rice said that scientists should be able to observe 95% of the Moon’s angles over the course of the experiment. “We want to get about 2 to 3, 4, or 5 years to get statistics on those types of effects,” he said. The biggest challenge? The atmosphere. Even at 3,300 meters above sea level and with Hawaii’s famously clean and stable air, the atmosphere can cause some distortion to the measurements, Rice said. The solution? More calibration, of course. In addition to instruments that can help measure and correct for factors like humidity, temperature, and aerosols in the line of sight, Rice’s team hopes to fly a spectrograph on one of NASA’s high-altitude aircraft to take measurements of the Moon above the atmosphere. “If we get a couple of those points, we can check the atmospheric corrections we’re planning to do from Mauna Loa,” he said. Citation: Loomis, I. (2017), Exact moonlight measurements could aid Earth-observing missions, Eos, 98, https://doi.org/10.1029/2017EO087639. Published on 27 November 2017.